Notice Board at Ballinderry Presbyterian Church. The first settlement in this neighbourhood was at Glenavy. In February 1672 the Presbytery of Antrim sent one of their number to examine what encouragement there was for the settlement of a minister. In April Robert Scott and John Johnston appeared as commissioners at the Presbytery and they were recommended to build a meeting-house and manse. In August the people obtained a hearing of Mr. Archibald Young (lic. Antrim) and they presented him with a call in the September following, promising to give him £30 per annum, and to provide him with a house and garden. He proceeded with his second trials; but in May 1673 he had a call to Downpatrick, which the Presbytery permitted him to accept, and he removed there in June. In September of the same year the people presented a call to Mr. Matthew Haltridge, which he accepted; and in February 1674 their commissioner, John Ferguson, promised for his support £25 per annum, with a sufficiency of turf and a manse. With the exception of a visit to Cork in June and July, he continued to supply the congregation till December, when, the people having failed in their promises to him, the Presbytery freed him from the charge of this place. He was afterwards settled in Ahoghill; and Glenavy was thus again left vacant. In January 1683 Mr. David Airth, another Scot, is found settled in this parish, having been ordained here some time in the interval between 1675 and that date. His support being small and badly paid, he was declared transportable in August 1685; and in June 1694 he removed to a charge in Scotland. The congregation was now long vacant. The next minister, Mr. John Riddel (lic. Down) was ordained by the Presbytery of Belfast on 12th March 1701. In 1712 he was prosecuted as a non-juror. In 1713 the congregation of Ballinderry, as it at present exists, was formed, part from Glenavy and some from Moira, while the greater part of Glenavy was incorporated into a later erection at Crumlin. Mr. Riddel was still alive in 1728 and a minister without charge. The commissioners from Ballinderry to the Synod were Arthur Maxwell, Esq., a great benefactor of the Presbyterian Church in Ireland, Dr. Ferguson and Thomas Beatty. Their first minister after their separation was Mr. John Hasty (lic. Belfast) who was ordained on 11th July 1724. He died while minister here on 6th April 1743. Mr. Clotworthy Brown (lic. Templepatrick), son of Rev. Alex. Brown of Donegore, was ordained here on 5th February 1746, and was of the non-subscribing party. He did not stay long, resigning on 4th August 1747, but even his short stay prompted the organization of the Secession cause in the neighborhood (Magheragall). He removed to Ballynure and was followed by Mr. William Rowan (lic. Killyleagh) who was ordained on 30th October 1751. He was disannexed from his charge for marrying people clandestinely who were not under his care, and resigned in July 1783 and died in 1795. Mr. Robert Carlisle (lic. Belfast) was ordained in September 1784, and later relieved of his charge on 6th May 1794 because of mental infirmity, and Mr. William Whitlaw (lic. Belfast) became his successor in August 1794. After Mr. Whitlaw’s ministry of 32 years Mr. John Shaw (lic. Belfast) became his assistant and successor on 6th February 1826. He resigned when called to Ballynahinch on 10th August 1831. On 17th April 1833 Mr. Henry Leebody (lic. Bangor) became assistant to the Rev. William Whitlaw who died on 11th January 1836. Mr. Leebody also obtained an assistant and Mr. James Meeke (lic. Belfast) was ordained on 24th May 1877. Mr. Leebody, whose son became Professor of Mathematics and later President of Magee College, Derry, died on 17th May 1879. After retiring from active duty on 15th September 1927, Mr. Meeke died suddenly on 21stSeptember 1928. The Union Commission then decided that Rev. Robert George McFarland, minister of Moira, should undertake the pastoral oversight of Ballinderry for a trial period of twelve months, with a view to possible union if it proved to be satisfactory. The union came about and Mr. McFarland was installed in Ballinderry on 14th March 1929. He died on 26th August 1937. The second minister of this united charge Mr. William Leathem McCombe (lic. Glendermott) who was ordained in Moira and installed in Ballinderry on 24th March 1938. He served as Chaplain in World War II and was Presbytery Clerk from 1950-76. A new Church Hall was erected at Ballinderry in the early 1950s and is known as the Stables Hall. A new Church Hall was opened at Moira on 24th March 1973 to meet the needs of a growing community. Mr. McCombe retired on 31st July 1977. His successor, the Rev. Joseph Frederick Crawford, who had been a missionary in Jamaica, was installed on 11th January 1978. 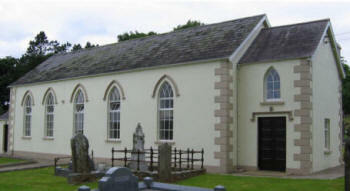 A new Church Hall at Ballinderry was opened on 3rd March 1990 by the Very Rev. Dr. Godfrey Brown; and in 2000 a new extension was added, linking the new Church Hall to the Stables Hall. The Rev. W. L. McCombe died on 2nd April 1982. Mr. Crawford resigned on 5th October 2000 when called to Newtown and Bowden, Scotland. The union with Moira was ended in October 2000 and in June 2001 the Rev. William Henry was appointed Stated Supply Minister at Ballinderry and preaches there most weeks. During Mr. Henry’s ministry a new extension was added to the minister’s room, greatly improving the churches facilities. It was opened on 20th May 2005 by the Rev. Bobby Liddle - Moderator of Dromore Presbytery. The first Presbyterian congregation in the area was in Glenavy where Mr Matthew Haltridge was ordained and installed in 1674. In 1713 Ballinderry became a separate congregation, with members from Glenavy and Moira, although it was 1724 before the first minister Mr John Hasty was ordained. The congregation was united with Moira in 1929 and the Rev Robert George McFarland was installed in March 1929 as the first minister of this united charge. A church hall was built in the early 1950s and a second church hall was opened in March 1990. In 2000 a new extension was added, linking the new church hall to the Stables Hall. The union with Moira was ended in October 2000. In June 2001, the Rev William Henry, minister of Maze Presbyterian Church, was appointed Stated Supply Minister at Ballinderry and preaches there most weeks. During Mr Henry’s ministry a new extension was added to the minister’s room, greatly improving the church’s facilities. It was opened in May 2005 by the Rev Bobby Liddle, Moderator of Dromore Presbytery.